A diamond that is an AGS Triple Ideal Cut and has crisp Hearts & Arrows is the most perfectly fashioned diamond in the world. Beware of diamonds exhibiting a partial Hearts & Arrows pattern that is not crisp and sharp. These are not genuine Hearts & Arrows. Hearts & Arrows are usually found only in diamonds that meet American Gem Society Laboratories' AGS"0" Ideal Cut requirements. The scope is merciless when it comes to any deviation from perfection. Any detour from the correct path of light will result in the deformation or absence of either hearts or arrows. This device, as unassuming as it may appear, can clearly show even the untrained eye how well or how poorly a diamond is cut. Why aren't all diamonds polished to Hearts & Arrows Ideal perfection? The answer is time and money. It takes an experienced cutter years before he is able to achieve this level of perfection. 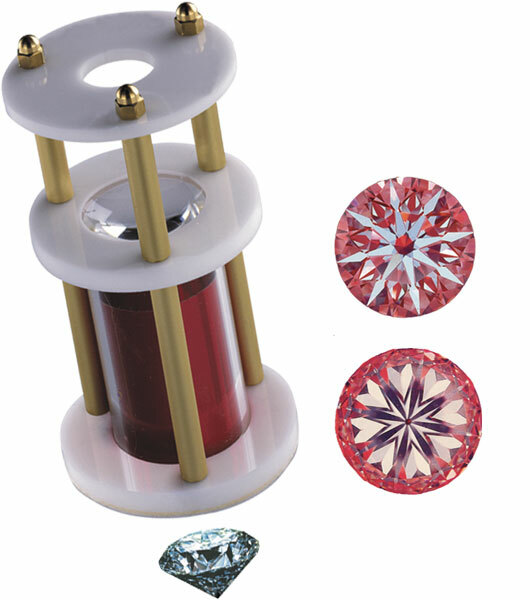 In many cases cutters do not want to cut these elite stones. Being paid by the piece, cutters would rather mass produce inferior cuts for which there is more demand. Once a master cutter has started polishing a Hearts & Arrows Ideal Cut Diamond, it will take about 2 to 3 times longer to finish than it would an average diamond. He will use his 10X loupe many hundreds of times, and will check his work by computer a dozen times. He will also polish away much more of the original rough diamond than he would if he were cutting a standard stone. On the average cutting a Hearts & Arrows Ideal Cut Diamond will require a 15% greater waste of the original material. So, over the course of a year, one can easily imagine the hundreds of hours and extra carats lost to dust that this level of precision requires.